A five-member Ministerial Committee comprising Ministers Nimal Siripala de Silva, Athauda Seneviratne, Keheliya Rambukwella and A.H.M. Fowzie has been appointed to look into claims made by people affected by the recent floods. Disaster Management Minister A.H.M Fowzie told the Sunday Times he had suggested Cabinet appoint a committee to deal with the disaster in the wake of the recent floods. “Once we receive the claims we will start functioning as a committee” he said. Kapila Wickremasighe, an owner of a book shop at the People’s Park said whenever it rained heavily, his shop was affected. I have lost stocks worth nearly Rs 300,000. 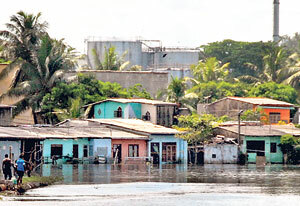 The Urban Development Authority agreed to build an underground canal to prevent future damage due to flooding,” he said. Assistant Director of the Disaster Management Centre, Pradeep Kodipilli said 272,000 people were affected by the floods and among them 20,554 people were displaced and live in 22 welfare centers. “The centers are situated in different areas of Colombo ranging from Sri Jayawardenapura, Kotte, Ratmalana, Kolonnawa and Maharagama”, he said. Kodipilli said Rs. 50,000 would be given to rebuild a damaged house while Rs 20,000 would be provided to repair partially damaged houses.